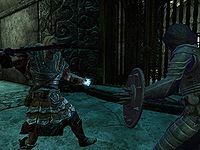 Sulla Trebatius is a hostile Imperial spellsword located inside Alftand ruins. He was leading a group of adventurers into the ruin, hoping to be the first one to unearth its hidden treasures. You can learn of their fates by finding various remains and journals spread throughout Alftand. His group was unknowingly stalked by the Falmer within and eventually captured while they were sleeping. 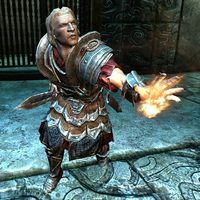 After the group escaped their cell, Sulla refused to give up his treasure and continued down the ruin, where he can be found near the end with Umana, hiding from a Dwarven centurion. Despite describing the Redguard as his constant companion and bodyguard, it appears their unfortunate journey in the ruins has driven them both mad and they are having a heated argument over the treasure. They will both attack anyone else on sight, but if left alone he will ultimately attack Umana—a fight he will most likely lose since she is equipped with the Targe of the Blooded. He is clad in full Imperial Armor without a helmet, though an Imperial Officer's Helmet can be found in his pack, and fights with a rare enchanted Imperial Sword in one hand and Destruction magic in the other. There is an expedition manifest written by Sulla found in the campsite outside Alftand, inside one of the shacks, lying on the ground next to a chest. Sometimes his body disappears after the fight. This page was last modified on 9 February 2017, at 16:48.